Thanks to Jennifer Faye! 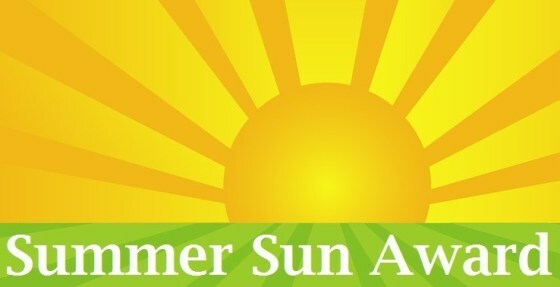 She nominated me for a Summer Sun Award. Favorite song with summer in the title or the words (give the line) “Well, Jenn stole All Summer Long” by Kid Rock and I don’t want to be a copy cat, so I’ll have to say Summer’s Comin by Clint Black. It’s a great song to play in the spring to remind you of what’s around the corner. Favorite book about summer: Liz Fielding’s Flirting with Italian. There’s a subplot in the book about a long-lost love from World War II that is as romantic as the main story. I’m not sure if the book takes place in the summer or just warm weather – but who cares. It’s still great. Favorite summer memory. Ushering at the Williamstown Theatre Festival. Volunteered every summer. We’d work for free, see the plays for free and have a wonderful time.. Favorite summer holiday destination. Fenway Park, baby! Go Sox! What books will be in your suitcase this summer? I just finished A Writer’s Space by Eric Maisel. Next up is The Long Way Home by Cathryn Parry, and Too Good to be True by Kristan Higgins. What’s your likely destination this summer? Already been – went to Atlanta for the RWA Conference. Rest of the summer is full of stay-cations. What hottie would you most like to be sharing the hot days and long nights with this summer? My husband of course. Although we both agree that George Clooney is an acceptable substitute. Remember how last week I said I was starting a new story? It’s one twelfth written! *Flails Kermit arms* The first few chapters are the absolute hardest to write. I find I write Chapter 1 at least three times. Or five or six times. I think I finally have a handle on these characters though. It’s onward and upward!